Update: I have used this project as a base for a new soundboard app so the master branch will no longer work with this tutorial. Please use the eclipse-build branch of the project if you wish to follow this tutorial. I have updated the git command accordingly. Recently our soundboard apps were removed from the Google Play store for copyright reasons. In response to this we decided to make the source code we used to create those apps available to everyone by posting it to a Github repository. 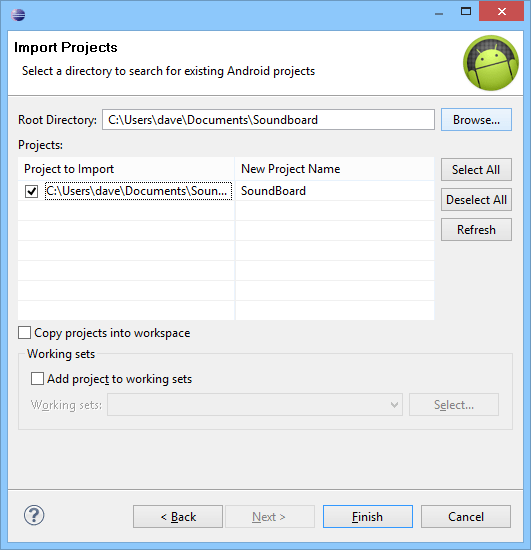 In this post I am going to walk you through the process of setting up your own soundboard app using our source code. If you follow all the steps I layout for you, you’ll have your first soundboard up and running in no time. Here is a quick guide to getting your environment setup for android development. Okay now that you’re all setup lets get down to business. If you have git installed on your machine you can simply clone the repo from github using the clone command. If you do not have git installed simply download the repo as a zip file from here and unzip it. 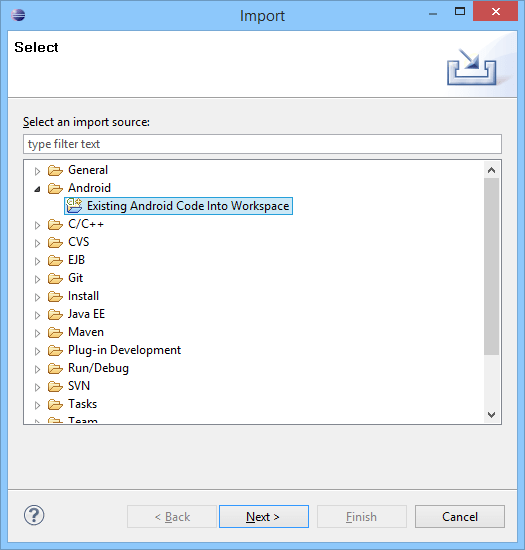 From the Import dialogue click the android folder and select “Existing Android Code Into Workspace” and click next. In the next window browse to where the root of the project directory is and select it, then click next. You should now see the project in eclipse. 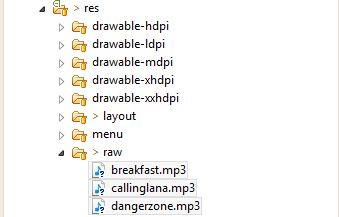 Add your sounds to the res/raw directory of the project. I am using mp3’s but any type of sound file should work. Also note that all file names MUST be all lower case, eclipse will show an error in your project if any of the file names don’t work. Add your display names and file names to the filemap.txt file. The filemap.txt is a key-value pair file with the key being the display name, i.e. the name you want to appear on the app, and the value being the filename of the file you want to play once the display name is clicked. Also please note that the file extension is not needed in the filemap.txt, just the name of the file. Run the project as an Android Application on your device or your AVD and your done.